Essai sur la Topographie de Sparte et de ses Environs Pour le Voyage du Jeune Anacharsis. 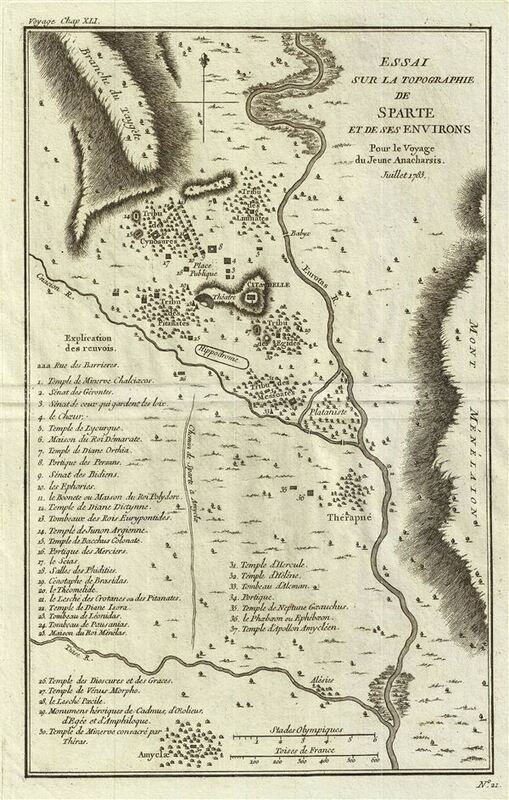 This lovely little map of Sparta, in the west of Ancient Greece, was prepared by M. Barbie de Bocage, after D'Anville, for the 1785 Travels of Anacharsis. Unlike its rival city Athens, Sparta left very little in terms of archeological ruins so we can only assume that much of this map is conjecture. Nonetheless, it is surprisingly detailed and does indicate important landmarks, including Sparta's theater, hippodrome, and citadel. Also indicates the relative position of the five Tribes' camps.